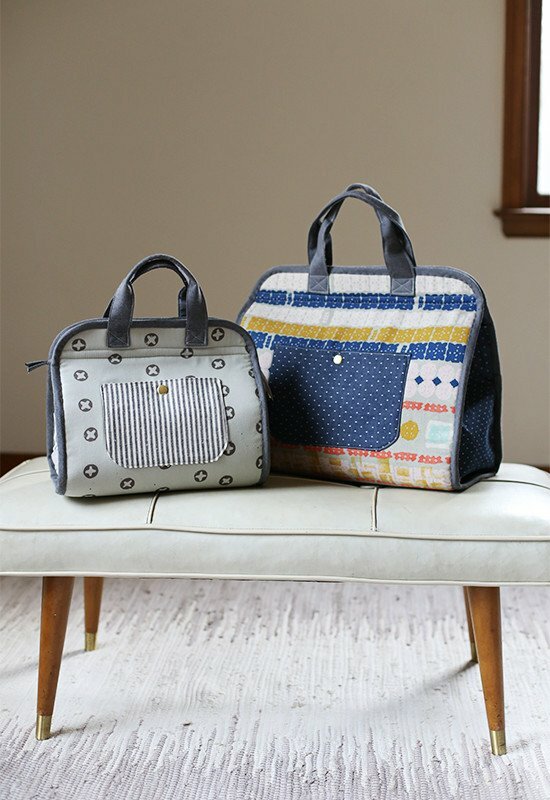 This carry-all tote is for the makers, the creatives, and the go-getters. It’s a spin on a classic doctor’s bag, but designed with handy on-the-go storage in mind. This tote will be sure to keep whatever you need close at hand and organized. - Select fabrics for the pattern. The pattern suggests 4 different fabrics (exterior, lining, pocket and accent). You may use more or fewer fabrics. It is suggested the zippered pocket lining fabric matches the exterior fabric. - Pre-cut fabric from the pattern. We suggest cutting fabrics and interfacings an extra inch larger than needed. - Iron on interfacing and cut pieces to correct dimensions. - If exterior and lining fabrics are not directional, cut (1) 33x16”. Otherwise, cut (2) 17x16” pieces which then sew together to accommodate directional fabrics.